Dakos (pronounced NTAH – kos) is the name of a Cretan barley rusk. This salad is made using this rusk as its base and it is topped with cubed tomatoes, crumbled feta, myzithra (a whey cheese made in Crete) or anthotyros (similar to ricotta) and flavoured with oregano. The rusk is also called krithrokoulouro or Koukouvagia (owl) in Crete, but to be frank I don’t know why they are so called. Probably because the rusks look like the owl’s eyes 🙂 Ntakos is a lovely mezes or a light meal on its own and very healthy. From all the places I have been in Greece, Crete is my favourite.The Cretan people are wonderful and very hospitable.Wherever you go they will offer you tsikoudia also called raki or what is called tsipouro in other parts of Greece and Zivania in Cyprus. It is the traditional Cretan alcoholic drink, which is made from the leftovers of the grapes when making wine. The pomace is distilled and what is produced is a very strong drink containing 35 – 65% alcohol. It has a very strong taste and this you will receive as a treat from the locals in every village, city, restaurant, or coffee shop.Even when traveling on the Cretan ships you will be offered tsikoudia. By accepting it is a confirmation of a new friendship and part of the welcoming procedure. A couple of shots are enough to make you stumble so don’t overdo it if you don’t want to get drunk. Their food is fantastic. Spicy and aromatic.There isn’t a single herb you can’t find in Crete.When we were traveling to Sfakia, we stopped near the edge of a gorge and I picked some sage. Travelling around you will see the goats on all hillsides, and maybe that’s the reason the meat is so nice and tasty. As for their cheeses, most of them are unique and not made in other parts of Greece, staka, malaka, xynomyzithra, myzithra, graviera, kefalograviera the list is endless. No wonder why every neighbourhood in Athens, has its Cretan products’ shop. There is one just near my house and today I got the barley rusks and myzithra. Most of the herbs I have, I’ve brought them from Crete when I visited during summer. 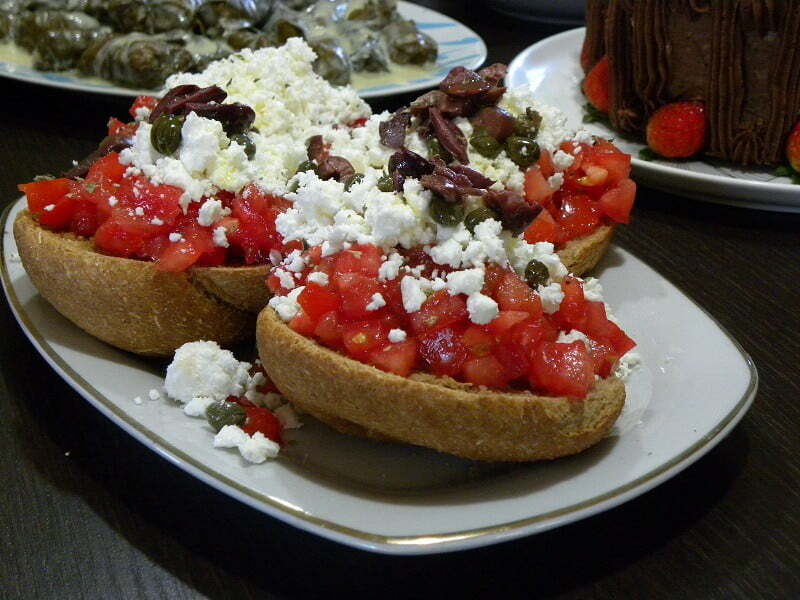 One of our favourite things we used to eat in Crete is Dakos. Barley rusks, either big or small ones, wet under the tap just for a few seconds or quickly dipped into a bowl with water, finely cubed or grated tomatoes are added on top and soft fresh myzithra cheese and feta cheese, salt and oregano and topped with extra virgin olive oil on top. Cube the tomatoes and season with salt, pepper and oregano. Αdd a few slices of olives, some capers as well as the basil and mix. Spread the tomato mixture over the dakos and add the crumbled cheese on top. Finally top with the olive oil and sprinkle with more oregano. Let it rest for 10 – 15 minutes for the rusk to absorb the juices and soften. Note: In Chania, they use xynomyzithra, a local cheese which is produced only in Chania and is something between feta and myzithra. A mixture of feta and myzithra or anthotyros (whey cheeses similar to ricotta) will also work well. Crete is still on my “to do” list. Dakos from Cretan barley rusks are delicious and healthy. I have come to appreciate the smaller sized DAKOS with finely chopped pieces of olive flesh scattered through the rusks. By their inclusion of the olive bits, the rusks are marginally softer to crunch upon. The flavour is definitely enhanced. Instead of making this lovely tomato and feta salad, when you have olives embedded in the rusk they make an ideal dip into any meat stew or thick soup taken in winter. Hello Gerald. Glad to know about this. I will see if I can find them in Nafplio.